Suzi Gage has won an Ockham award for her podcast Say Why to Drugs. 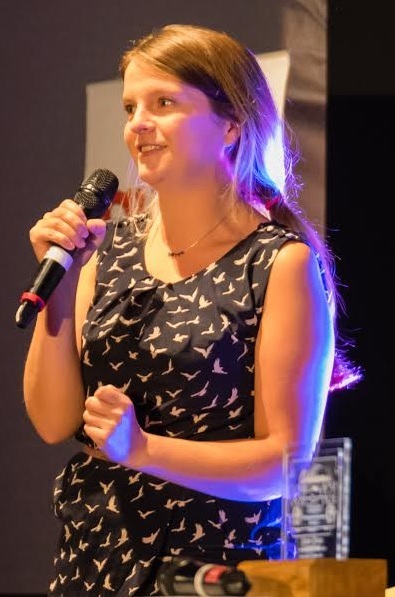 Post doc Suzi Gage has been recognised by The Skeptic Magazine for her podcast Say Why to Drugs, as she has been awarded their annual Ockham Award for best podcast. The award was presented at QEDcon in Manchester last weekend. She beat competition from the Godless Spellchecker podcast, the European Skeptics podcast and the League of Nerds podcast. Say Why to Drugs is an episodic podcast, looking at a different recreational drug each week and discussing the scientific evidence surrounding it, as well as busting myths and misconceptions that exist around the substances. It is presented by Suzi along with rapper and podcaster Scroobius Pip. Episodes so far have included cannabis, tobacco, alcohol, MDMA and psychedelics, as well as an interview with the Bristol Drugs Project. Suzi has recorded more episodes which will be uploaded in the coming weeks and months.